What You Get: A easy, tasty yam dish with extra flavor and texture. What You Need: A few baking sheets, no other special equipment required. How Long? About and hour and fifteen minutes, with about ten minutes of active time. With a little planning, an “anytime” dish. Place rack(s) in the middle of the oven and preheat oven to 400 degrees. 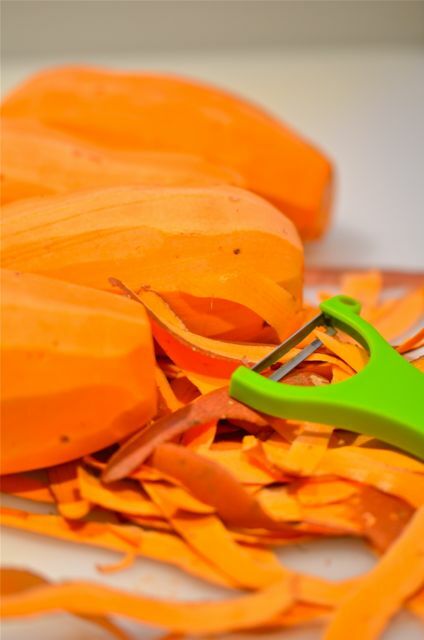 Peel and slice the yams into 1/2 inch thick half-circles (keep the smaller pieces in circles). Combine the salt, sugar, pepper, chili powder, cayenne (if using) and oil in a bowl. Stir until combined. 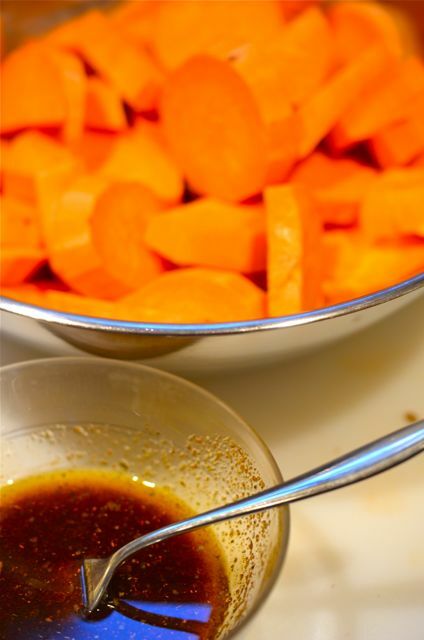 Place the yams and spice mixture in a large bowl and toss until all the yam slices are evenly coated. Arrange the yam slices on a baking sheet and place in the oven. 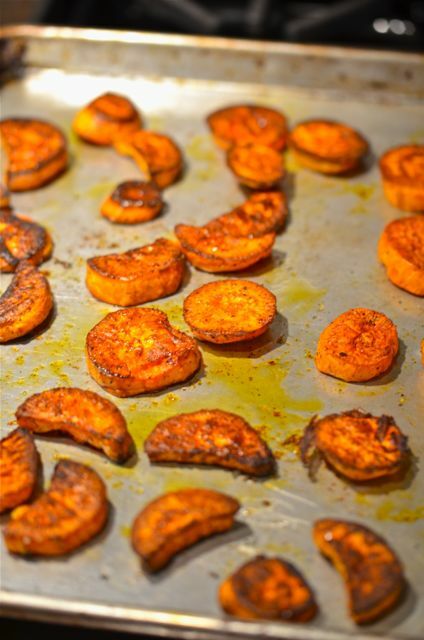 After 30 minutes, remove the baking sheet from the oven and flip-over each yam piece. Return to the oven and cook for another 30 minutes. 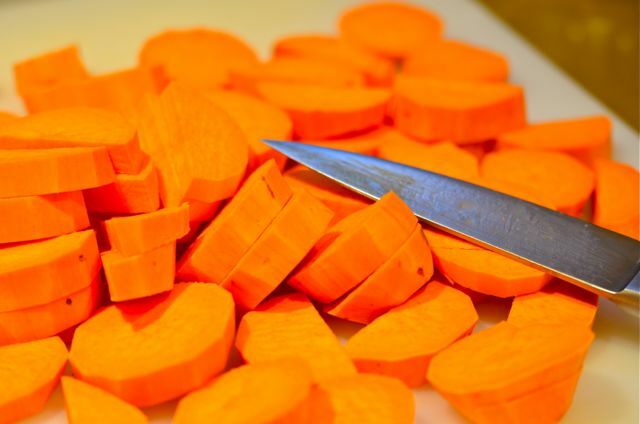 (Remove smaller yam pieces after 20 minutes or when they brown and start to shrink slightly). Remove the baking sheets from the oven. 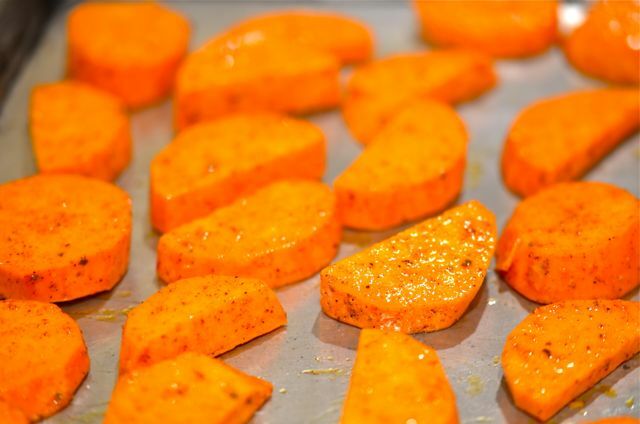 Serve the yams while hot, add butter, salt and pepper to taste. Garnish with a few sprigs or parsley, if you like. I’ll get right on that finding of yams that are even from end to end…. expect a report back sometime within the next ten years. We eat a crap ton of oven-roasted potatoes, sweet potatoes, turnips, parsnips, onions, you name it. And I agree, some of the best batches are the ones flavored with chili powder! Chiming in here- chili powder on sweet potatoes/yams is divine! It adds a heat that really brings out the natural sweetness of the vegetable. Yum. 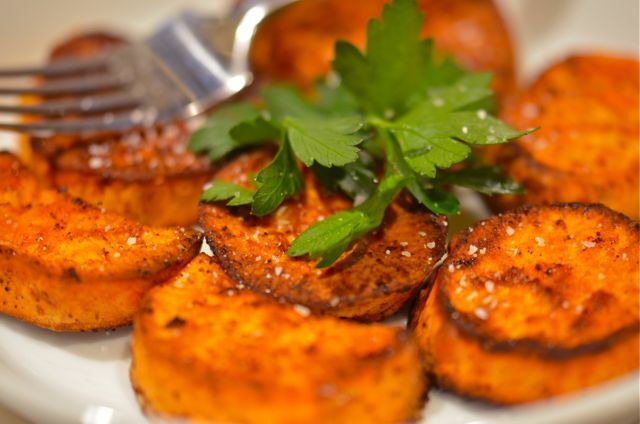 These wedges look so good- can’t wait to add them to my regular mix of sweet potato recipes! 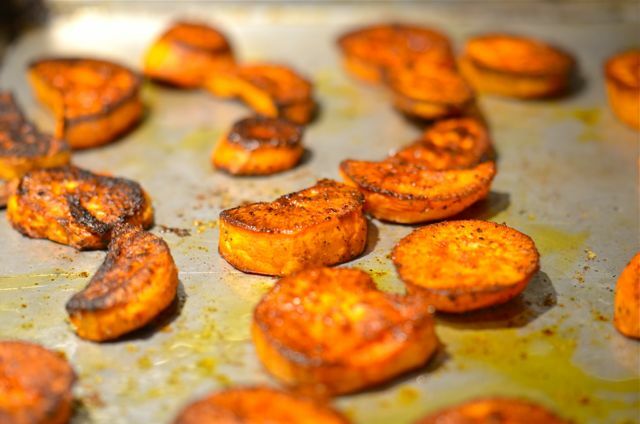 I love roasted sweet potatoes, but don’t eat them often enough. Mouth is watering. Will definitely be making these soon. YUM! Bookmarked! These sound delicious. And you’re right, my farm share provides tasty sweet potatoes but boy are they not . . . . attractive. Thanks! Hope you enjoy the recipe…and they do look better cooked! An even thickness…that would definitely take quite a search to find. I think spicy seasonings go so well with the potatoes. Thanks…we will continue our hunt for the elusive “evenly shaped” yam..
Ha! 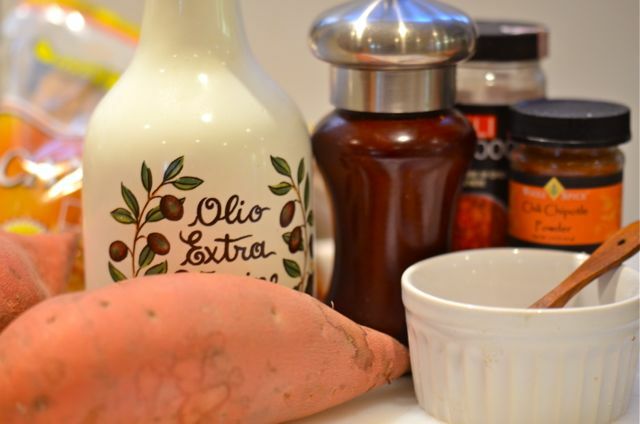 Even shaped yam… Well that aside, sweet potatoes are one of my top favorite starches! I always make a sweet potato dish for thanksgiving, per request of my dad who loves my cooking! This is a quick & easy dish with marvelous tasty results! Thank you for sharing… and for the little laugh! Never heard about Yams – first I thought it was Sweet Potatoes, but with google-help I found out that it’s a root. Neither have I heard about sweet butter – you have some wired things over there – but I think I can use sweet potatoes for this one. Lover oven baked sweet potatoes. Sweet butter I have to replace with unsalted. Thanks for this one. Strange because … when I googled – they didn’t say it was sweet potatoes – glad my eye sight is still okay. Thanks for making everything clear to me. Sweet butter I thought was one of the those wired products you have over there.